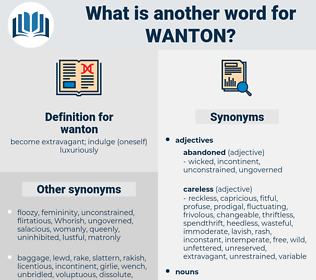 What is another word for wanton? flagrant, gratuitous, unscrupulous, intentional, unbridled, irresponsible, ruthless, pointless, brazen, uncontrolled, irrational, meaningless, haphazard, nonsensical, ferocious, unreasonable, unjust, savage, cost-free, unrestrained, free-of-charge, unprovoked, capricious, brute, wild. indiscriminate, unjustifiable, arbitrary, unjustified, deliberate, unwarranted, blatant, reckless, brutal, premeditated, rampant, mindless, random, barbaric, cold-blooded, unnecessary. righteous, thoughtful, good, careful, kind, decent, wise, moral, nice, clean, chaste, observant, gentle. 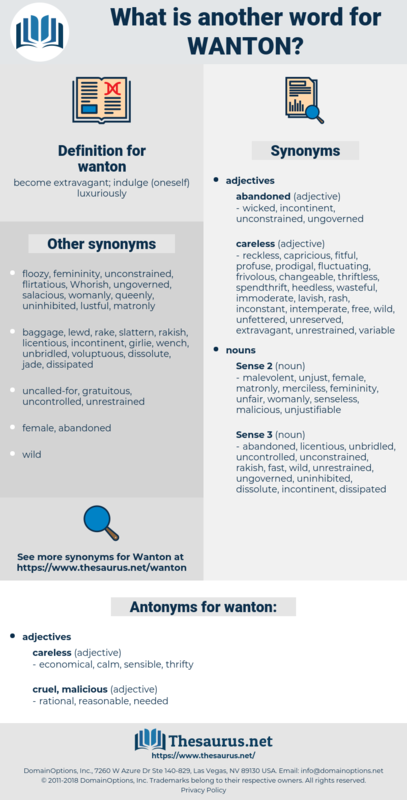 humane, desirable, perfect, charitable, frigid, sanctioned, maidenly, innocuous, becoming, lily-white, genteel, puritanical, peaceable, peaceful, immaculate, prim, decorous, approved, celibate, virginal, proper, pure, modest, spotless, agreeable, fit, pleasant, monkish, virtuous, acceptable, endorsed, clement, benign, lenient, pleasing, G-rated, respectable, merciful, pacific, welcome, correct, monastic, warm, polite, wholesome, straitlaced, pitying, seemly, innocent, suitable, meet, inoffensive, priggish, undersexed, staid, appropriate, prudish. You know Richard Yorke, you wicked, wanton wench! They have connected it with their system of dikes, and for years have kept sentries posted to protect it against wanton injury. chat up, coquet, dally, butterfly, mash, philander, coquette, romance, flirt.